Or help one fainting robin. What’s your life’s purpose, your mission? This week we will learn from the salmon who start and end their mission at home. More instinct and nature helps them fulfill their purpose. But we’ll also ask Carrion Crows in the Japanese city of Sendai how they have creatively learned to use new information far from their home turf to eat, using passing traffic to crack nuts for them. Kids need a purpose in their life. Adults do, too. And so do churches. Our community activities, our ministries, must fulfill our mission, the the purpose of our ministry. What’s your mission? We must listen to Jesus. How will we help jesus fulfill His mission in Cape May? Let’s listen. Let’s learn. Let’s Lead. 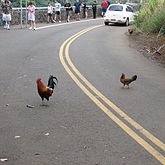 Why did the chicken cross the road? To get to the other side. Why? Why cross the road? What was there? What we have learned in watching lots of chickens over the years is the chicken follows other chickens. Most chickens follow the leader. So that means there are other chickens who are leading. Who take a new step. And when that new step, or direction, is a positive one, something helpful and inspiring, others will follow! You follow. But you also lead. Why did the chicken cross the road? Because other chickens did. The question is, who are we following? And where are we leading others? We want to lead in the right direction, getting others to the best side; a great future God has prepared for us! 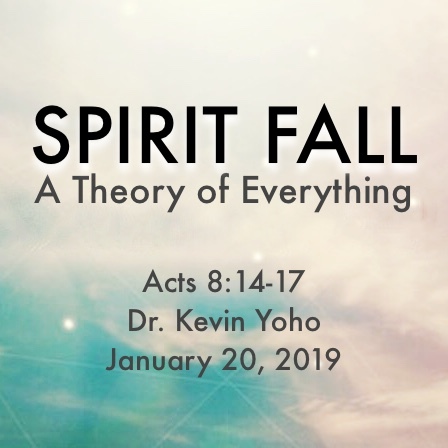 In this week’s message from Acts 8, we will meet a group of people who didn’t know about the Spirit. At all. They knew about Jesus, all right, but no one introduced them to the power of the Spirit of God or how they could connect to that power. What’s more, they discovered how once the Spirit falls on your whole life, everything is changed for the better. Yes, its a theory of everything touched by God’s Spirit. You want to find out more? Great! Because the Spirit is falling! We don’t how to best demonstrate God’s loves to others. Whether we’re saying the right thing in the best way. We don’t know whether they will be grateful or annoyed, or whether they will say something mean in return. Here’s a piece of paper which includes messages about God’s love from the Bible. Both sides are filled with inspiring words of hope. Let’s pretend you have these messages to share with me, so try to get the “message” to me. Go ahead, maybe throw the paper towards me! Wow, that didn’t get to me. Nope, it just fell to the floor. Crumpling up the paper may get it to me, but when I receive it I can’t read it! How else can those inspiring words get to me? It needs a lift! Create a paper airplane! Now, the wigs give the message lift, and it can fly right to me! Go ahead, send me airmail! Got it! All these folds are like the Holy Spirit, and the wings catch the power off the Spirit which will give our messages strength to get to the people we care about. If we’re going to show the fruit of the spirit, love, joy, peace, patience, faithfulness, and show God’s love to others, we need the “direction” of the Holy Spirit and the “lift” only the Holy Spirit can give! Now that’s inspiring! Are You Ready to Grow From Tourist to Explorer? (More people are responding, “Yes!” to that question. How about you?) If you’re ready to say Yes!, our 2019 Explorer Membership Orientation begins February 10, 9:15 AM in the Red Brick Church. We are delighted that you have found many reasons to be involved at Cold Spring Church! You have worshipped with us, attended our events, volunteered in numerous ways, and have become an important part of our community of faith! We are honored by your current connection with us. But if you’re looking for something more, I have an opportunity for you to consider! We hope now is the time for you to say “Yes!,” and attend our informal and informative Explorer Membership Orientation starting Sunday, February 10th. We will gather for three Sundays in February: 10, 17, and 24. Our 45-minute sessions will begin at 9:15 on the 2nd floor of our Red Brick Church Worship Center! Bring your questions, doubts, and stories as we get to know one another and the unique benefits and responsibilities afforded to members, as we consider the foundations of the Christian faith. Let me know this week that you want to build a new future as an Explorer in 2019! This is the year of possibilities that starts right now! However you choose to connect, we are delighted that you are part of our community! RSVP today! 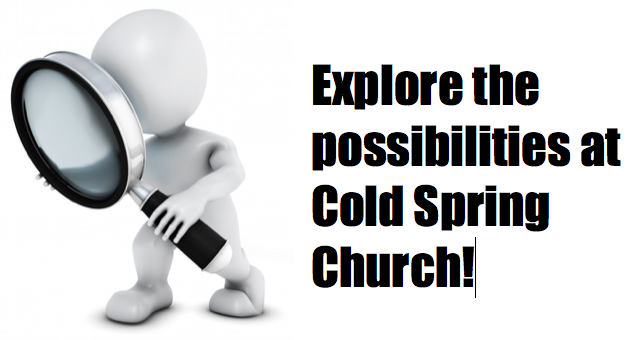 Call 609-884-4065, or email hello@coldspringchurch.com. I hope to see you at 9:15 for our first class on February 10, 2019. How to Use the Brickette and the Connections to be informed and share the news! Happy New Year! 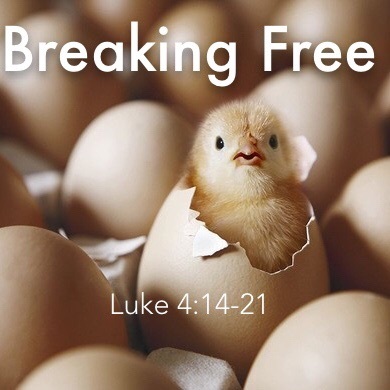 Thank you for being connected to Cold Spring Presbyterian Church. 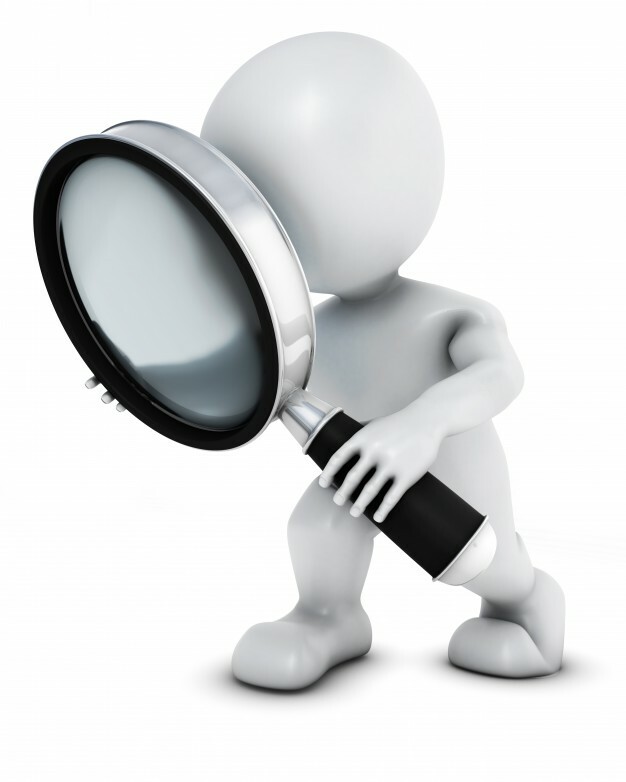 There are many ways to be involved in our community, and two of them are easy to access and share! The first week of each month, the Brickette will highlight upcoming events and tell the story of our community of faith as it enters its 305th year of ministry, witness, and mission. Remember to sign-up to receive the weekly Connections news brief. While the Brickette is a monthly review and pre-view, receiving our Connections in your inbox (usually sent Thursday each week) will give you a timely, quick read of the weekend-ahead events including worship, activities, and lots of photos that help tell the amazing way people like you are making a difference in greater Cape May. You can catch-up on past issues of both the Brickette and the Connections online, too. So get connected and share what God is doing in our community. Today is Epiphany, the last day of the Twelve Days of Christmas. Did a few of your ordered Christmas gifts arrive after Christmas?! Sure, it happens. While upsetting, we and the recipient are likely to appreciate the gift. The Three Kings did not arrive late. They were right on time before they even met him, they knew he was worthy of their best. 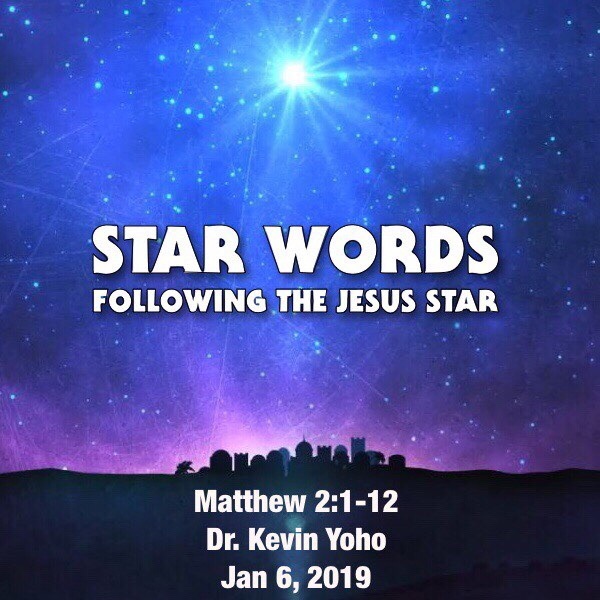 We, too, celebrate the day when the Star of Bethlehem, a very bright moving star, came to a rest just above the spot where Jesus lay, ending its journey from the East and leading a caravan of Magi to the Christ child. The word Epiphany literally means a season of light and Jesus is the source, he is the Light of the World! He is the shining Star. Celebrities in our culture are VIP’s from sports, to entertainment, to politics. Some stars are rising and others falling and we should be careful not to follow their words too carefully. You just don’t know where they will lead you! We can also be our own “star” as if wearing the T-Shirt that reads, Its All About Me. The Three Wise Men remind us that we are not the star, but rather Jesus is and we have an opportunity to reflect his light, no tonly in our community of faith, but even better, to the community at large! That is our mission as a church. And God invites you to give your very best, too. Can 2019 be the year you give Jesus your very best so that you can live your very best selves, the abundant life Jesus’ promised to us? I think it can! 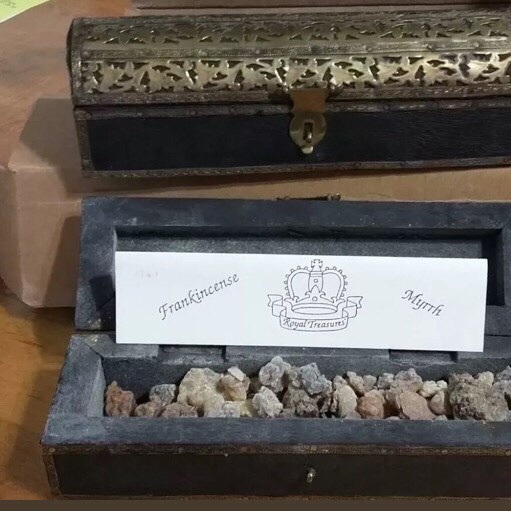 Today, as you are sent out after worship, I will open this box of Frankincense and Myrrh and if you’re ready to give your best to Jesus, go ahead and take a piece. We have plenty for all of us. But its up to you. Wow, the Three Kings presented their best and they didn’t even know Jesus. Now here we are, all these years later, and we have tasted and seen the goodness of the Lord, we know that God did not send his son into the world to condemn it, but that the world through him would be saved! Now that’s Good News. Star Words for the year ahead. The Three Kings, the astronomer, astrologer, Magi, knew something about Jesus before they even met him. The knew he was special because they saw the brightest star in the sky, brighter than anything seen before. It guided them to Jesus. And they present gifts to Jesus fit for a king. Gold. Frankincense, and Myrrh. We’ve seen gold. But Frankincense and Myrrh are pretty unusual. Here is a special box of these unique nuggets which are derived from the gummy sap that oozes out of the Boswellia and Commiphora trees when their bark is cut. It’s so rare that these items were essential currency and worth a great deal. So the Three Kings gave Jesus something very special. They just didn’t reach into their pockets and see what they found. They prepared and brought their best. You know? God loves us, and wants us, our very best and even loves us when we seem to offer our worst! But as we look forward to a new year, I wonder if you’re ready to give God your unique best? Your best time, energy, and attention. If you’re ready to do that, please take some Frankincense and Myrrh with you. Carry it with you, or keep it in a special place in your room to remind you that God loves you and you decided to give him your very best this year.